Lockmaster Maps were the brainchild of Douglas M Smith, a keen railway and waterways enthusiast, an avid boater, pilot, father of two, husband and a trained land surveyor by trade. In 1972 Doug purchased his dream house Kingswood Cottage (albeit in not such good condition) with his wife Jane, up until then they had resided on Doug's small converted pontoon boat 'The Flying Pig', a boat that Doug had travelled the waterways in for some time. Kingswood Cottage was one of the 6 famous barrel roofed cottages situated on the Southern Stratford Canal in Rowington, Warwickshire and not only had direct access to the towpath but also clear views to the London/Birmingham railway line. Shortly after moving into Kingswood Cottage Doug's freelance land surveying business suffered due to the 70's oil crisis and both Doug and Jane looked at a variety of initiatives to keep the mortgage paid and food on the table. They started a local village black cab taxi service, and as the National Trust had not long opened the Southern Stratford Canal they took advantage of the passing trade and sold freshly baked bread, fruit and veg fresh from the garden and canal books from the doorstep of Kingswood Cottage directly to boaters and canal enthusiasts, and thus the Lockmaster business was born. As Doug had trained with the Ordnance Survey at the start of his land surveying career and was a devotee of the canals having lived and travelled them in the Flying Pig, Jane suggested he drew a map of the Stratford Canal, as it wasn't then covered by any other canal maps. Jane had imagined little hand drawn maps being sold from their shop but Doug had other plans and soon produced 'The Avon Ring'. It was drawn at 1" to the mile and he had both that and the half scale maps printed which were then taken to boatyards and canal shops to gauge a response. 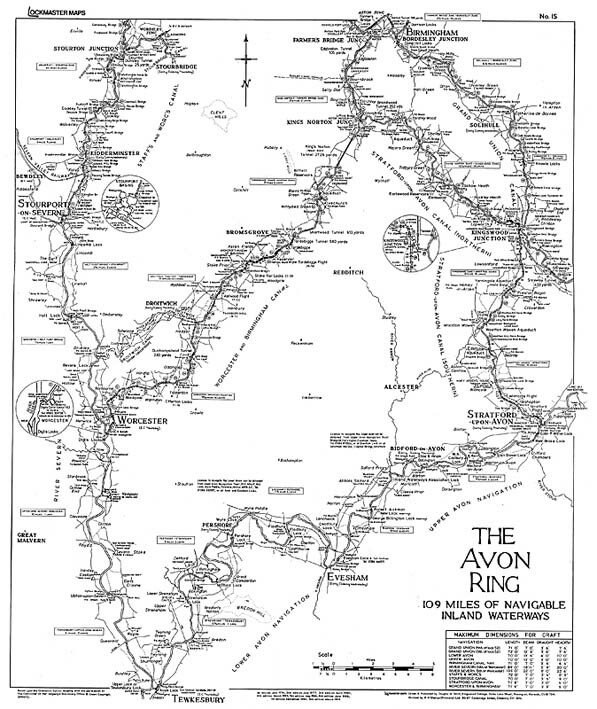 The Avon Ring was a huge success and the start of a very exciting time for the family. Doug went on to survey the whole of the UK's inland waterways system on his bicycle, taking notes of locks, bridges, amenities, shops and public houses along the way. On his return to Kingswood Cottage he would meticulously draw each map by hand using Rotring pens to define the routes he'd travelled, hand drawing every detail and hand writing every place name using his calligraphy skills. The complete series of Lockmaster Maps were printed and distributed by Doug himself (with help from his family) to canalside shops, post offices and boatyards across the UK, along with a huge range of other canalware products, postcards, tea towels, brass plaques, gifts & games, a lot of which his wife Jane had hand painted with roses, castles and other themes of the waterways. 40 years on and the Lockmaster Map range is still going strong, giving boaters & canal enthusiasts a guide to navigate the UK's waterways as well as an incredible work of art.